So far we’ve stocked our freezers with bargain meats, veggies and fruits and made a few big batch recipes to help us make quick dinners on busy days. The next step in freezer management is to add some breakfast foods and snack items. One of the quickest and easiest items to prepare for the freezer is french toast. Go buy a loaf of thin sliced sandwich bread at Aldi for $1. Bring it home and prepare french toast as you usually would, using up the entire loaf. Then lay the slices out on a cookie sheet (used waxed paper and layer them if needed) and stick it into the freezer. When the slices are frozen, drop them into a gallon-sized ziploc freezer bag and label it. When you’re craving french toast for breakfast, simply toast in the toaster just like frozen waffles. Speaking of waffles, there’s another fast breakfast that’s easy to stock for the freezer. Take your typical waffle recipe and double or triple it, freeze the waffles individually, then bag up when frozen. Muffins are a frequently requested breakfast at our house but most mornings it’s all I can do to make coffee, much less muffins. My solution is to mix up a few batches of favorite muffin varieties, put the batter into cupcake liners and freeze. Once frozen, put the “muffin pucks” into labeled freezer bags. When your crew is begging for muffins, just pull out the number needed, drop them into your muffin tin and slide it into the oven. You will need to increase the baking time by 5-10 minutes when baking from frozen. The bonus of this method is that if your kids can’t agree on what kind of muffins to eat, you can still give each of them what they want. 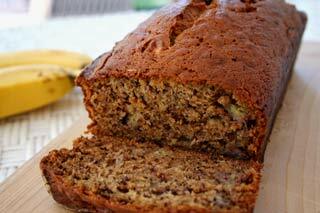 Another favorite breakfast treat at our house is banana bread. Banana bread is also great for welcoming new neighbors, bringing to friends when you visit and sharing with new moms when you deliver a meal (most people don’t think to bring breakfast items so this will be a welcome treat). I have perfected an assembly line technique that makes it easy to bake four loaves at a time so when I see the bags of ripe bananas at the grocery store, I grab all I can and make lots of banana bread. The recipe I’m going to share with you is from an old church cookbook I received from my mother-in-law at my bridal shower. This cookbook is one of three I just can’t live without. *To make this assembly-line style , line up the ingredients in stations around your kitchen table. Get the kids to help you by refilling each ingredient as you use it. We’ve made as many as 20 loaves in one day using this method. Cream together 1/2 cup cooking oil and 1-1 1/2 cups sugar. Add 2 eggs beaten well and 3 mashed, ripe bananas; beat well. In a separate bowl mix 2 cups flour, 1/2 tsp baking powder, 1 tsp soda and 1/2 tsp salt into the mixing bowl along with 3 tbsp milk and 1/2 tsp vanilla extract. Stir in 1 cup chopped nuts if desired (I never use nuts since so many are allergic now). Pour into greased loaf pan and bake at 350 degrees for 1 hour. (My oven does better at 325 for 1 hour 15 minutes) In my experience, three batches of this recipe will fill four loaf pans as the recipe makes just slightly more than you need for each loaf and the excess from three batches is enough to fill a fourth pan. Four loaf pans fit side by side in my oven so I can bake four at a time. Cool completely before removing from pan. Wrap cooled loaves with plastic wrap and then aluminum foil. Be sure to label and date before freezing. NOTE: One reader asked me about the safety of using aluminum foil and plastic wrap in freezing foods, voicing concern about a link to dementia and chemical leaching in plastics. I have done quite a bit of research online and cannot find any reputable sources that confirm either concern. Plastic wraps and aluminum foils must meet FDA food safety requirements and are both considered safe for freezer use. It has been proven that plastic wraps should not be used in microwaving due to chemical leaching through heating but this is not applicable to freezer use. The Saran company website suggests that if foods will be frozen for longer than two weeks, it is recommended that you use freezer bags instead of plastic wrap to prevent freezer burn. I hope this answers any concerns you have about using foils and wraps with frozen foods. Combine 1 1/2 cups all purpose flour, 1 tsp baking soda, 1 tsp cinnamon, and 1/2 tsp salt and set aside. In a large mixing bowl, blend 2 sticks unsalted softened butter, 1 cup firmly packed brown sugar and 1/2 cup granulated sugar until creamy. Add 2 beaten eggs and 1 tsp vanilla extract and beat well. Slowly add in dry ingredients and mix until smooth. Mix in 3 cups uncooked oats and 1 cup raisins with a spatula until evenly distributed. Chill dough for 15 minutes. Use an oiled teaspoon or cookie scoop to measure out 2″ diameter balls of dough onto cookie sheet. If freezing, transfer frozen dough balls into a freezer bag until ready for baking. If baking, preheat oven to 350 degrees. Bake 10-12 minutes or until golden brown (longer if cooking dough from frozen). Cool 1 minute on cookie sheet then transfer to a wire rack to cool completely. Makes 3-4 dozen. Optional bar cookies can be made by pressing batter into an ungreased 9×13 baking pan and baking for 30-35 minutes. As always, I welcome your comments! Feel free to ask questions or share your ideas or recipes as we learn about freezer management together. Really enjoying this series! Have you ever tried doing 8 loaves in the oven? I had to swap them mid-way through cooking, but it worked. So I now own that many loaf pans! I’ve never tried freezing muffins before cooking. Sounds so easy that way! I’ve never baked 8 at one time, but I have 8 pans so I can immediately put 4 more in the oven when the first 4 come out. I started freezing muffin batter because I never liked reheated frozen muffins and after experimenting, I realized it was easier to just freeze the batter. Jennny, First of all, I want to thank you for researching about the safety of using foil and plastic wrap when freezing. I knew you would make sure if they were safe. I love your ideas of freezing muffins, and the many other things. I go to Aldi’s a lot. In fact strawberry bread is one of my favorites and they have California strawberries for .99 today. They are huge and are delicious!. I bought four cartons and will be using some to make strawberry bread with my diabetic sugar “Sweet Addtions” which I get at Aldi’s for only $3.99 a big bag. I can’t wait to see further ways to save food. People are starving all over the world we need to buy the foods that the stores will eventually throw away instead of fresh fruits all the time. Some stores like my Bi-Lo said they are not allowed to put anything on reduced rack anymore. They throw it away. What a shame. I buy most of my fruits from Aldi’s and get sometimes bananas from HT on reduced rake. My son has his own business and he takes items to the stores. He said, you would not believe the food that is thrown away! I actually just watched a documentary “Dive! Living Off America’s Waste” about wasted food in the US. It was very eye opening and actually motivates me to look harder for the marked down foods to keep them out of the trash. Definitely more conscious of food waste at home too!